There are probably a couple of factors at work here. One, I lack the patience for it. I use it all up on my family and preparing all the homemade food I already make. More work? No patience. The second factor is my own insecurities. Every time I actually try to turn food into something cute and fun I feel like it looks like a second grader did it. Pinterest failures? I could be the head of that class. 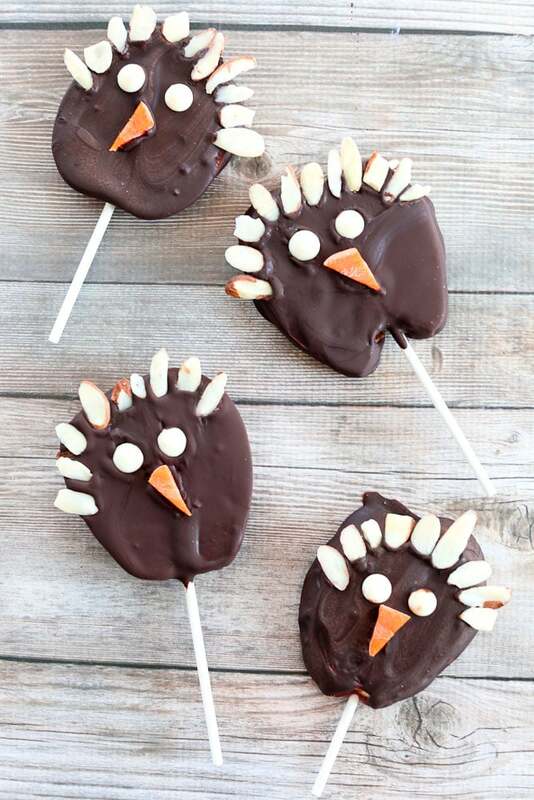 I decided that just this once I could muster up some extra patience and swallow my insecurities to make these Chocolate Covered Apple Turkey Pops for Thanksgiving. At first, when I saw the results of my efforts, I was deflated. These don’t look like turkeys. I’m a failure as a mother. Just kidding about that last one. I never thought that. But I was feeling like they weren’t up to snuff. Then I showed them to my kids. So. Much. Excitement. They loved these before they even tasted them. And after they tasted them they loved them even more. Suddenly, I felt like a million bucks. Nothing like a boost of confidence from your five and nine year olds, right? This experience made me realized something important. Our kids don’t want perfection. The effort I made was more than enough for them. They knew that I took extra time out of my day to make their apples look like turkeys. They showed real, actual appreciation for it. Even though I still don’t consider myself a fun food mom (have you seen my kids’ boring lunches on my Instagram stories??) I know I’ll be doing this kind of thing a little more often. It’s worth the excitement my kids had. Before I get to the recipe, I have a quick secret for you. 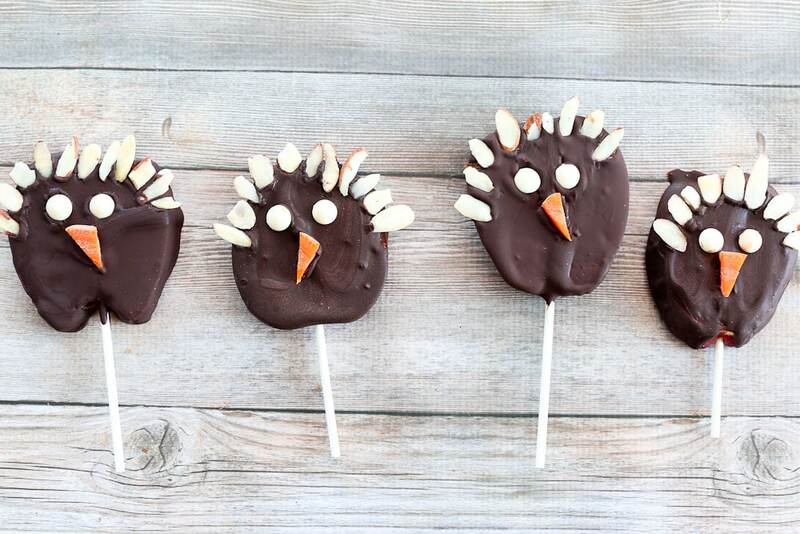 Even though these Chocolate Covered Apple Turkey Pops are a special treat I created for Thanksgiving, they are a special treat with a nutritional boost. Why not?! We all know what comes along with the hoilday season: too much sugar and not enough sleep. We can try to avoid is as much as we want, but it’s inevitable that our kids are going to be eating more sugar and probably sleeping a little less than usual when the hustle and bustle of the season kicks in. 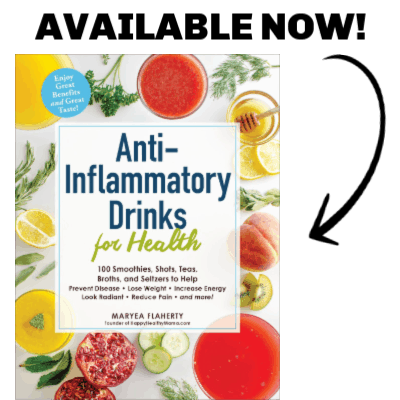 Do you know what sugar and lack of sleep do to an immune system? Yep. Both things take a major toll on the strength of our kids’ immune system. 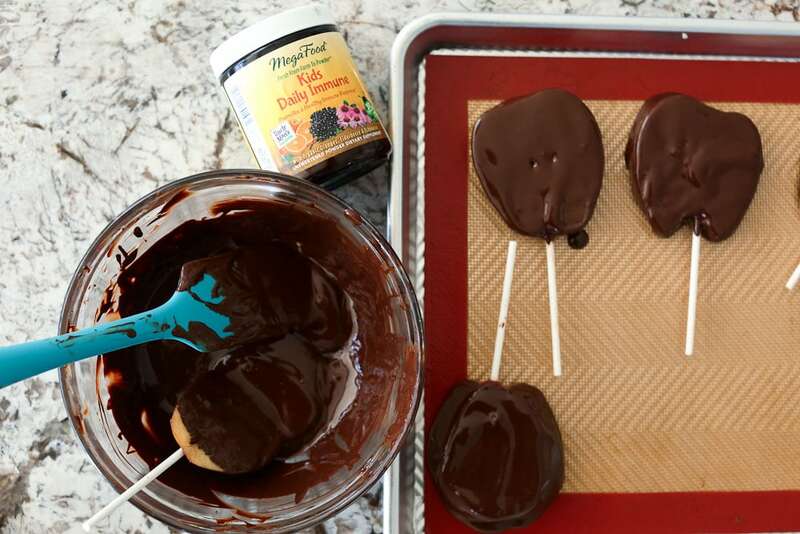 These Chocolate Covered Apple Turkey Pops are going to help counteract that because they are boosted with MegaFood’s Kids’ Daily Immune Nutritional Booster Powder. As moms, we have to do whatever we can and for me, MegaFoods nutritional booster powders have been such a blessing. I try really hard to get the best of nutrition in my kids through the food they eat, but sometimes, I know I fall short. That’s where these awesome nutritional booster powders come in. The Kids’ Daily Immune nutritional booster powder is formulated to support a healthy immune response in our kids. * Do you know a kid that couldn’t use that this time of year? The best part is your kids won’t even know it’s there. If you can add some immune-boosting power* to your kids’ Thanksgiving treat, why wouldn’t you? Find out where you can pick up the Kids’ Daily Immune Nutrient Boosting Powder by checking the store locator here. 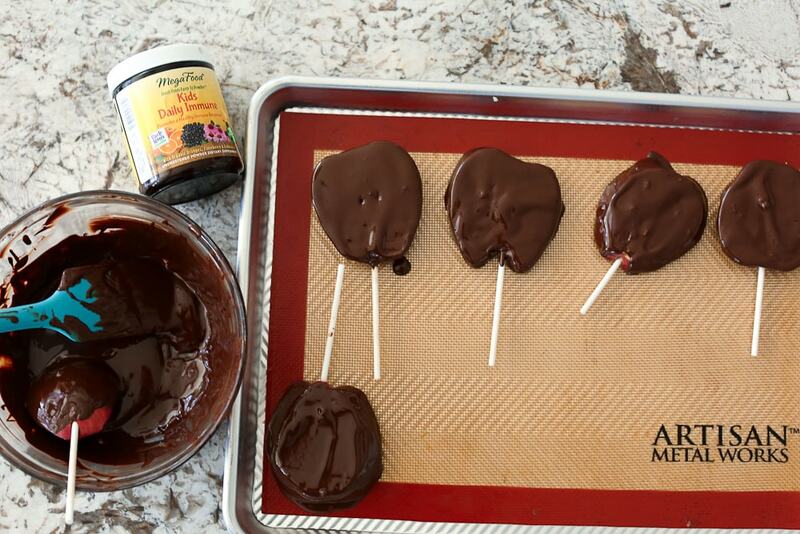 Here’s a quick picture tutorial showing how easy it really is to make these Chocolate Covered Turkey Apple Pops. Have fun making them! 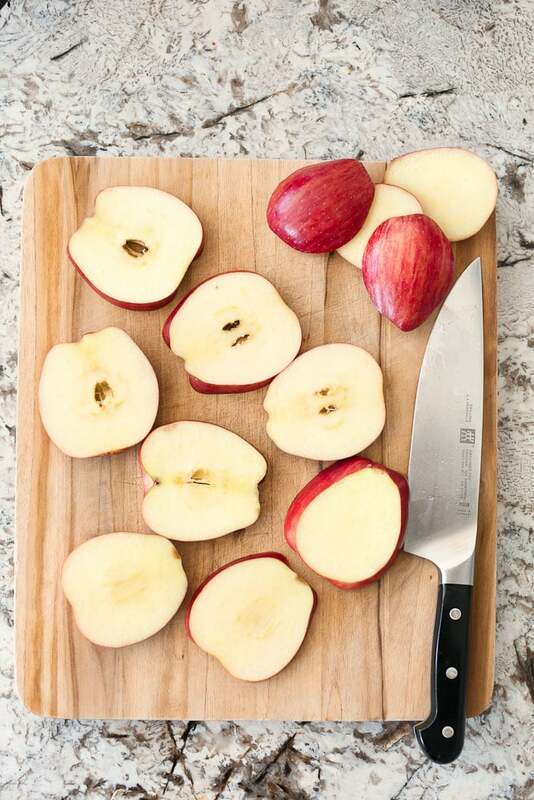 Slice your apples thickly. You want to make sure each apple slice is thick enough that it can accommodate a stick and not break or split. Pick out the seeds as best you can. 2. 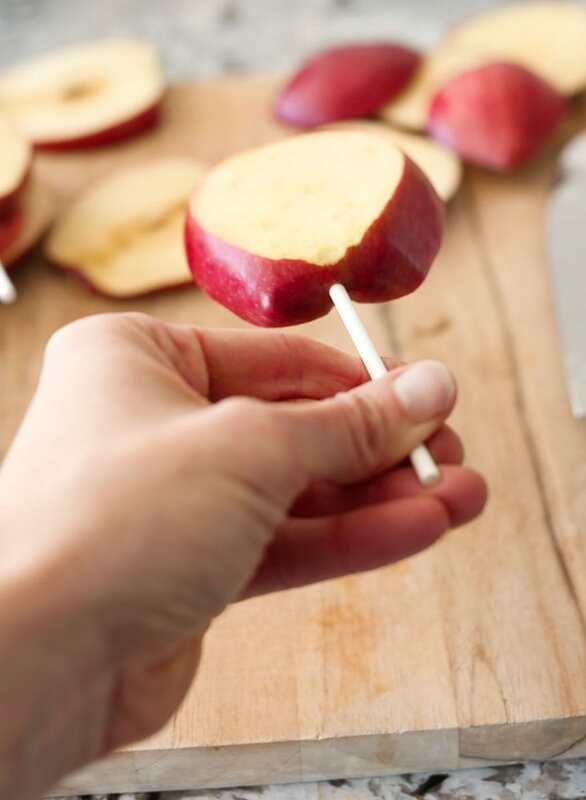 Now you add sticks to the apple slices. Now they look like apple pops! 3. Next you want to melt your chocolate. Once it is melted, stir in the coconut oil and 6 scoops of MegaFood Kids Daily Immune nutritional booster powder. 3. Now you’re ready to dip the apple pops into the chocolate. You can use a spatula to help spread the chocolate so it covers the whole apple. 4. Place the dipped apples onto a baking sheet lined with parchment paper or a silicone baking mat. 5. Working quickly, use the almond slices to create turkey feathers, white chocolate chips for eyes, and carrot triangles for the beak. 6. Put the tray in the freezer for 10 minutes. Here is the printable recipe as well! 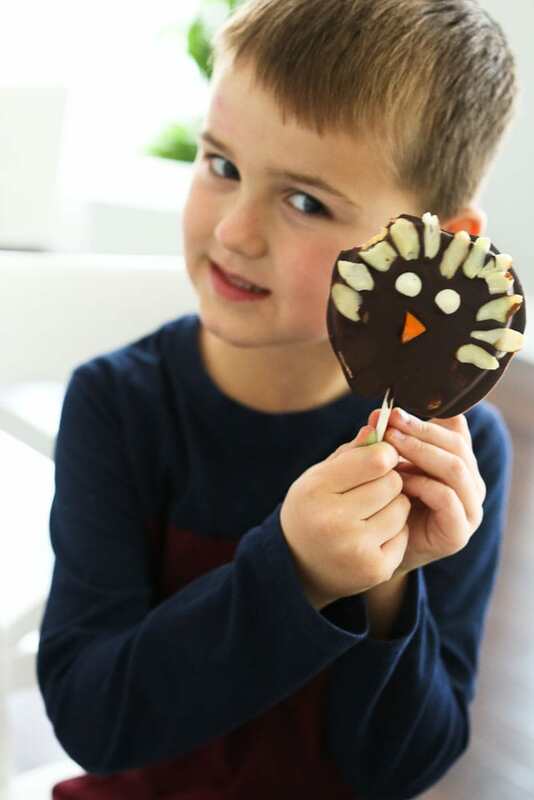 Boosted with MegaFood Kids Daily Immune nutritional booster powder, these Chocolate Covered Apple Turkey Pops are a healthy and adorable Thanksgiving treat for the kids! 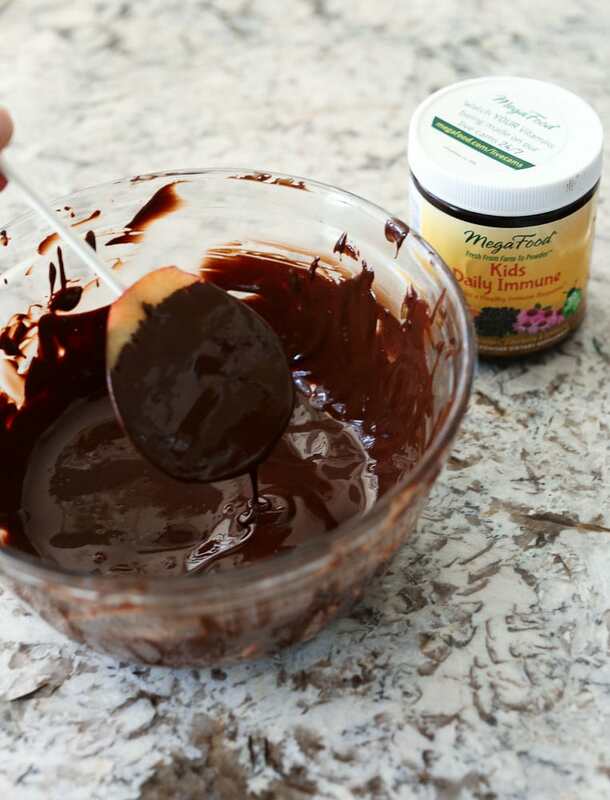 Stir the coconut oil and nutritional booster powder into the melted chocolate until the coconut oil melts and you have a smooth mixture. Cover a baking sheet with parchment paper or a nonstick silicone baking mat. 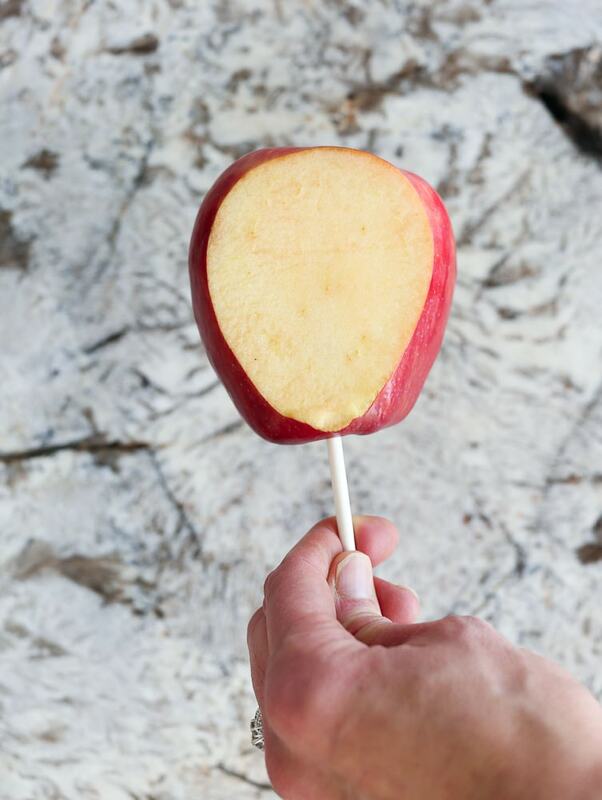 Carefully press a lolipop stick into the bottom of one apple slice. Dip the apple into the melted chocolate so it is coated on all sides. Place it on the baking sheet and continue with the rest of the apples. Working quickly, use the sliced almonds to create feathers on top of the apples. Then add two white chocolate chips for eyes and a carrot triangle for the beak. Put the tray in the freezer to firm up, at least 10 minutes. Enjoy! 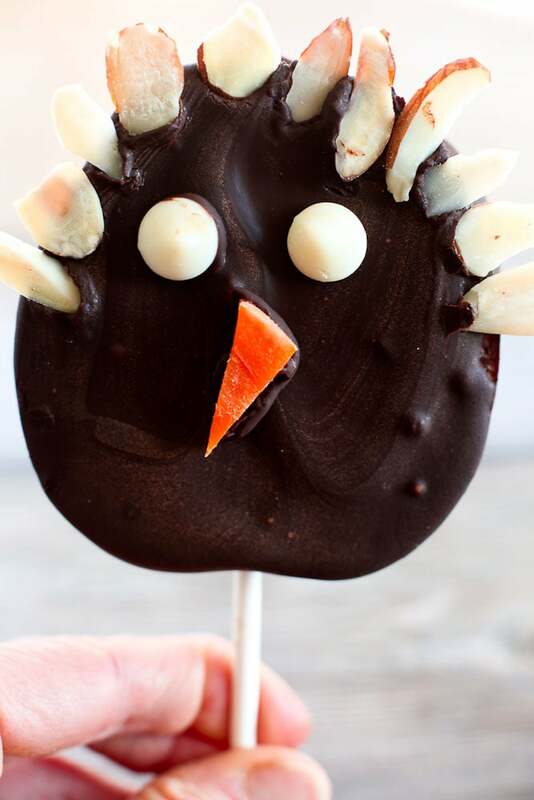 f you make this Chocolate Covered Apple Turkey Pop recipe, or any Happy Healthy Mama recipe, I would LOVE to see it! Please take a pic and share it on Instagram or the Happy Healthy Mama Facebook page and tag me @happyhealthymama ? This post is sponsored by MegaFood. All opinions are my own. Thanks for supporting the brands that make it possible to keep me spreading my mission through Happy Healthy Mama! These are super cute! I saw them yesterday and have not stopped thinking about them! I am going to make them on Thanksgiving for the kiddos, the only problem is that my son doesn’t eat chocolate, so I guess I’m thinking of making a white one, but that really wouldn’t look like a turkey! I’m going to just try it though, and follow your lead. I’m sure the kids will love them! If you can get your hands on the nutritional booster powder, it has a brown-ish color and might turn your white chocolate brown! Double bonus. 🙂 I hope your kiddos love these!